Jermain Defoe grabbed his first international goal in four years and Jamie Vardy scored only six minutes after coming on as England defeated Lithuania in Sunday's World Cup qualifier. They remain unbeaten in Group F but this was not an eye-catching display by Gareth Southgate's side. 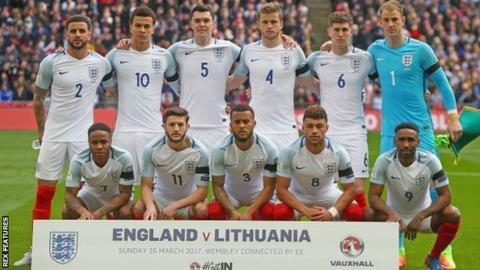 BBC Sport's chief football writer Phil McNulty assesses the performances of the England players. One scare in the first half when Arturas Zulpa's header looped over him but largely untroubled. Made one smart second-half save. Another assured display. Poor opposition must be taken into account but good concentration and looks at home at England level. Good last-ditch clearance in the first-half. Looked composed and confident. Odd sloppy moment but has shown himself an ideal replacement for injured Danny Rose. Solid and unspectacular. Like England. Very poor start and while the second-half brought improvement, a very strange selection ahead of Everton's Ross Barkley. Mixed bag. Set up Defoe's opener but still too wasteful. Took some heavy punishment from Lithuania in an attempt to test his temperament so was quieter than in Germany in midweek. Excellent. Energetic, creative and a perfect subtle touch for Jamie Vardy's goal. He's still got it. Looked a threat for the hour he was on and fully justified his recall to England colours. Tucked away his goal neatly but finishing still a little wayward. Did exactly the job Southgate wanted from him. Lively and full of fearless running.